Remember Operation Santa Claus? 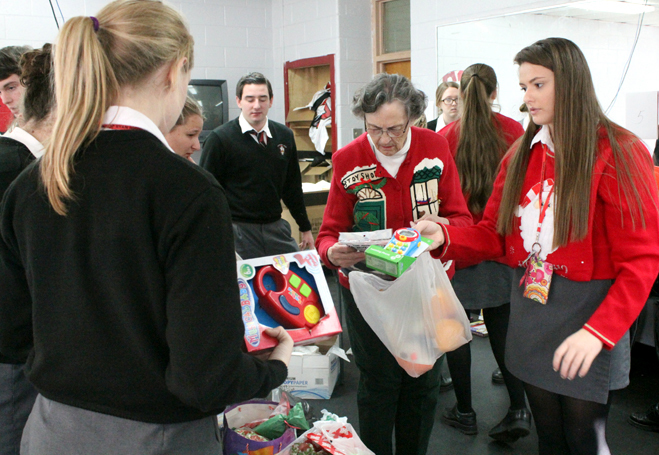 For many years it was a signature program for the Community Service Corps (CSC), with pretty much all of the Catholic high schools in the Archdiocese of Philadelphia participating by supplying toys for needy children during the Christmas season. It faded away a few years ago before the Office for Youth and Young Adults (OYYA) closed in 2012. One school where Operation Santa Claus is very much alive is Archbishop Ryan High School in Northeast Philadelphia. Sister of St. Joseph Frances Antoinette, who teaches theology at Ryan, has been running it for the past 24 years and has seen it grow from 81 children assisted to 183 children this year. The reason it is still going strong is because it was a strictly local effort independent of OYYA, although that wasn’t the case in the very beginning. “When I came I noticed none of the gifts were coming back to families from our feeder schools, so we started our own,” Sister Frances Antoinette said. The reason for this was the Far Northeast parishes did not have a high poverty rate relative to some other sections, particularly the inner city, where the gifts were distributed. But every area has some poverty and Sister Frances Antoinette thought the school should assist families in the feeder parishes from which Ryan received its students. A great many of the children helped are from single-parent families or divorced where the mother isn’t getting enough support through the children’s father, she explained. Although the feeder school system has been abolished, Sister Frances Antoinette sends the gifts to the schools in its traditional area, which still in fact supply the bulk of students to the high school. “We assist families in St. Albert the Great, Maternity B.V.M., St. Christopher, St. Anselm, St. Martha, Christ the King, St. Katherine of Siena (all in Philadelphia) and St. Charles Borromeo (Bensalem),” Sister Frances Antoinette said. She receives the names and ages of the children to be assisted from the local schools. Then they are assigned a number for confidentiality and these numbers are distributed mostly through the theology classes for all four years at Ryan. The classes are also where the fundraising is conducted to buy the toys, and more funds may be raised in other ways such as a bake sale. No one at Ryan, other than Sister Frances Antoinette, knows the names of the children who will receive gifts. The drive starts right after Thanksgiving and ends a week or so before Christmas. The gifts tend to be simple – board games, books, etc., and each child will receive six gifts, with a total cost of $35-$40. After the drive closes Sister Frances Antoinette’s students and those in the CSC go on a big Saturday shopping spree to such places as Five Below and Wal-Mart. Then a big wrapping party follows. The wrapped presents are then returned to the parish school where parents are asked to pick up the gifts. Nick Belamorich and John Thackrah, co-presidents of Ryan’s CSC, seconded those sentiments. “Operation Santa Claus is a great way to give back to the community and an awesome way to celebrated the true meaning of Christmas by being Christ-like in our actions,” Thackrah said.